[시사뷰타임즈] 오리건 주의 한 고속도로가 살아있는 뱀장어를 나라는 트럭이 전복돼 도로를 끈적대는 거의 4톤 정도의 뱀장어가 뒤덮자 모든게 끈적거리는 악몽으로 바뀌었다. 관계자들은 고속도로는 말끔히 청소됐고 차선들도 다시 개통됐다고 했다. 오리건 주 경찰은 KGW지에 에 따르면, 목요일 낮 12:00 경, 미국 101번 고속도로 북쪽으로 가고 있던 소형 트럭이 건설구간에서 정지하지를 못하고 전복되면서 사건이 시작된 것이라고 했다. 이 트럭은 ‘끈적대는 뱀장어’ 3,400kg을 싣고 한국으로 가려던 것이었다. 무게 중심이 이동하면서 뱀장어를 담은 통들 중 한 개가 트럭 밖으로 떨어졌다. 트럭에 남아있던 통들과 ‘평상형 트럭 받침대(트레일러 등의 평평하고 길지만, 일반 트럭들과는 달리 3면에 짐 유실을 막아주는 막이 판이 없는 것)가 분리되면서 다른 차량 4대가 서로 충돌하게 됐다. 트럭이 싣고 가던 내용물들이 그 즉시 주위 차량 및 고속도로 전체 위로 흘러나왔다. “우리 머리로는 무슨 일이 벌어진 것인지 계산이 되질 않았다”며 통들이 물을 쏟아대며 계속 가면서 가엾은 차량 3대에 도미노 효과를 일으켰던 것이라고 덧붙였다. 오리건 주 경찰은 사고 여파를 찍은 사진을 트위터에 올리면서 “이 지역에 가까이 가지 말라고 경고합니다”라고 적었다. 디포우 만 소방지구대는 사고의 결과로써 부상자는 전혀 없었다고 보고했다. 이 생명체들은 후에 먹장어였던 것으로 보도됐다. 오리건 주 어류 및 야생부서에 따르면, 끈적대는 뱀장어라고도 알려진 먹장어는 원시적인 무악어류(無顎魚類: 주: 악=이빨이 나있는 잇몸을 뜻함; 상악, 하악)이며 자신들이 괴롭다고 느끼면 몸 양쪽에 있는 샘에서 단백질이 주성분인 점액을 방출한다. 대청소를 하는 과정은 이 뱀장어의 점액이 물과 혼합되면서 두꺼운 끈적이 층을 형성해 놓았기 때문에 더뎠다. 디포우 만 소방지구대는 도로상의 끄넉이를 밀어내 없애기 위해 소방 호스 및 불도저까지 동원하여 몇시간 동안 작업했다. 오후 4시가 막 지나면서 ODOT(오리건 주 교통부)는 트위터에 모든 차선이 개방돼있지만, 이 지역을 지나가는 사람들에게 주의를 당부는 글을 올렸다. 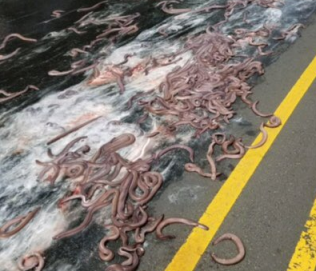 A highway in Oregon turned into a scene from a goopy nightmare when a truck carrying live eels overturned, covering the road with nearly four tons of “slime eels.” Officials said that the highway has since been cleared and all lanes have been reopened. Oregon State Police say the incident began when a semi-truck heading north on US highway 101 failed to stop at a construction zone and overturned around 12:00pm on Thursday, according to KGW. The truck was holding 7,500 pounds of “slime eels” headed to Korea for consumption. When the weight of the truck shifted, one of the containers fell off the truck. The remaining containers and the flatbed then separated, causing four other cars to smash into each other. The contents of the truck quickly spilled onto the surrounding cars and across the highway. The Oregon State Police posted photos of the aftermath on Twitter, warning travelers to stay away from the area. The Depoe Bay Fire District reported that there were no injuries as a result of the incident. The creatures were later reported to be Hagfish. According to the Oregon Department of Fish and Wildlife, Hagfish, also known as slime eels, are primitive jawless fish that produce a protein based mucous through the glands on each side of their body when they are distressed. The cleanup process was slowed by the fact that the eel’s mucus forms a thick slime when it is mixed with water. The Depoe Bay Fire District spent hours using fire hoses and even a bulldozer to push the slime off the highway.